Born Sept 8th 1987 Abena is one of four children. She is called Abena because she was born on a Tuesday and she is called Kwatemaa after her mother. She has a big brother and younger brother and sister. She is part of the Akan ethnic group from the Ashanti region; specifically her hometown is Adanse Brofoyeduru. She attended the University Primary and Junior Secondary School in Legon, Accra. Then gained admissions to Wesley Girls High School in Cape Coast where she took the general arts option. Her electives included Literature in English, French, History, and Economics. After graduating she went on to study at the University of Ghana; Abena is now a Junior majoring in English and Sociology. 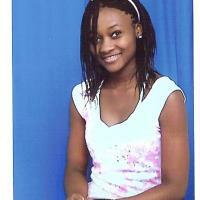 She still stays in touch with grade school friends; some of whom attend the University of Ghana. Abena's hobbies include reading-she loves reading and writing stories and poems...she hopes to one day publish fiction stories. She also loves swimming. At school Abena likes to hang out with her friends. Abena even has a drivers licenses-she's a very skilled driver who occasionally likes to go to beach during Hall Week celebration at school. A good cook-that learned to cook from watching her mom-she cooks a lot at school to save money. What a thrifty gal!! Abena loves hanging with her family...and if you want to come visit the holidays are the best times because the fridge is always full of food:)...Favorite foods include plantain-kelewele.